In 1969, Thor Heyerdahl, a Norwegian adventurer crossed the Atlantic ocean from the North African port of Safi, arriving in Barbados, West Indies. His craft was made by local Africans of indigenous papyrus. For his journey he relied on the southbound Canary Current off the coast of the Iberian peninsula and the western coast of Africa, and the Northeast Tradewinds that blow westward towards the Caribbean region. In his book Massaalik al-absaar fi mamaalik al-amsaar (The pathway of sight in the provinces of the kingdoms), the historian Chihab ad-Dine Abu Abbas Ahmad bin Fadhl al-Umari (1300-1384) describes an expedition into the Atlantic. The ruler who preceded me did not believe that it was impossible to reach the extremity of the ocean that encircles the earth (meaning the Atlantic): he wanted to reach that (end) and was determined to pursue his plan. So he equipped two hundred boats full of men, and many others full of gold, water and provisions sufficient for several years. He ordered the captain not to return until they had reached the other end of the ocean, or until he had exhausted the provisions and water. So they set out on their journey. They were absent for a long period, and, at last just one boat returned. When questioned the captain replied: ‘O Prince, we navigated for a long period, until we saw in the midst of the ocean a great river which flowing massively. My boat was the last one; others were ahead of me, and they were drowned in the great whirlpool and never came out again. I sailed back to escape this current.’ But the Sultan would not believe him. He ordered two thousand boats to be equipped for him and his men, and one thousand more for water and provisions. Then he conferred the regency on me for the term of his absence, and departed with his men, never to return nor to give a sign of life. 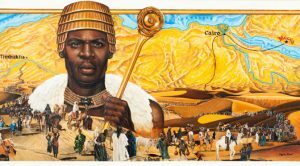 It is reported that a fleet landed in Brazil in around 1312, in the place now called Recife and that Pernambuco is allegedly an aberration of the Mande name for the rich gold fields of the Malian jurisdiction of the Moorish Empire. 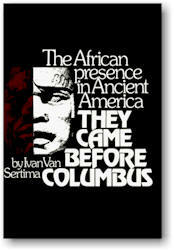 Ivan Van Sertima provided the following in an Article Entitled – Mandingo Traders in Medieval Mexico “Mandingo [Mandinka] Traders in Medieval Mexico “The Mandingo [Moors] practiced settled agriculture, and they must therefore have had fixed settlements in South and Central America. But their traders, by the very nature of the occupation, were nomadic, ever on the move. Passing through unfamiliar and sometimes hostile territory, they built temporary bases for their defense. Some of these bases, built on elevated mounds, strongly resemble West African stockades. A comparison of the Peul African stockade from F. Moors’s Travels into the Inland Parts of Africa with Le Moyne’s drawing of a Florida stockade made in the mid-sixteenth century (responded in De Bry’s De Commodis et Insularum Ritibus Virginia) is most striking. Both are circular, built of heavy upright posts, have an identical gate entrance, contain rows of circular huts, and within both the stockades are two fields. It is important to point out in this connection that the Peuls were part of the complex of peoples within the medieval Mandingo [Moorish] empire, and that their presence in pre-Columbian America has been further established by Jules Cauvet’s discovery of an amazing number of animal names shared between them and Guarani, an American tribe. There were several bases from which the African [Moor] traders spread in the two Americas: from the Caribbean in the Songhay period (circa 1462-1492); from the northeastern South America in the Mandingo period (1310 onward) into Peru; and from a base in Darien (Panama) moving along roads marked by the presence of burial mounds into and beyond Mexico, as far north as Canada. These burial mounds provide further witnesses to their presence and the lines of their dispersal. Within them, among the usual native items, are to be found pipes with West African heads and totems (see Chapter 11), other Negroid figurines and gadwals, and blue white shells.